Melbourne coffee royality, Brother Baba Budan Cafe, Little Bourke Street. 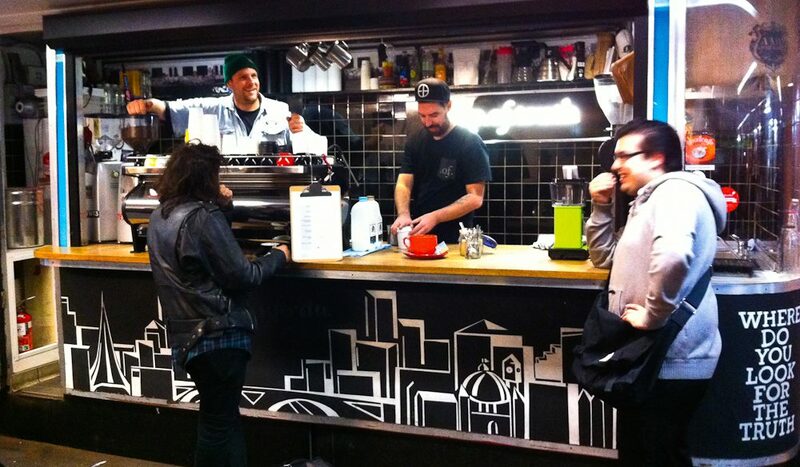 Finding truly exceptional coffee in Melbourne’s CBD can take insider knowledge. 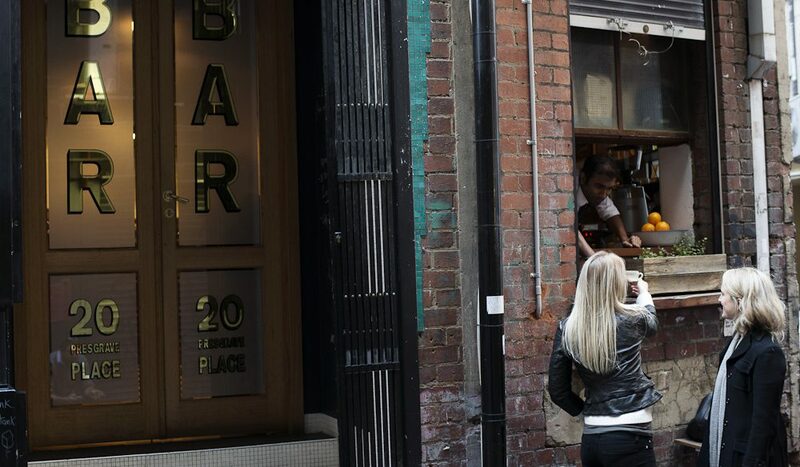 Come on a journey through the laneways to find the best of the best cafes. Fiona Sweetman spends her days trawling the world’s most mercurial coffee capital in search of greatness, as part of the Hidden Secrets Tours ‘Cafe Culture’ walk. Faithful to their southern European coffee-nook roots, Melbourne’s nouveau cafe elite are powered by a cupful of philosophies. Of course, Melbourne coffee must be ethically sourced, but the best also demand it to be seasonal, traceable and locally roasted, too. Your barista must possess PhD-like knowledge and the venue should effortlessly exude the latest ‘coffee couture’ décor. Often their coffee is more traceable than their locations and you may have to sit (if at all) on a communal table in a tight space. But that’s part of their charm, says Fiona. Let’s try a modern Melbourne cuppa a few different ways. The Cup of Truth seems like it’s from another indeterminate era; part hipster future, part film noir past. Owners Jon Freeman and Courtney Joel fill Campbell Arcade with scents of takeaway (only) varieties served with a double shot of cafe improv. “Stay high, stay dry,” says Joel. In a hurry? Simply throw money into the red ‘honesty cup’ on the counter. The brew: Coffee by Axil. Try the single origin of the day. Peckish: Peach, bourbon vanilla and almond muffins. Factoid: Campbell Arcade featured in the 1957 film On the Beach, with Gregory Peck and Ava Gardner. 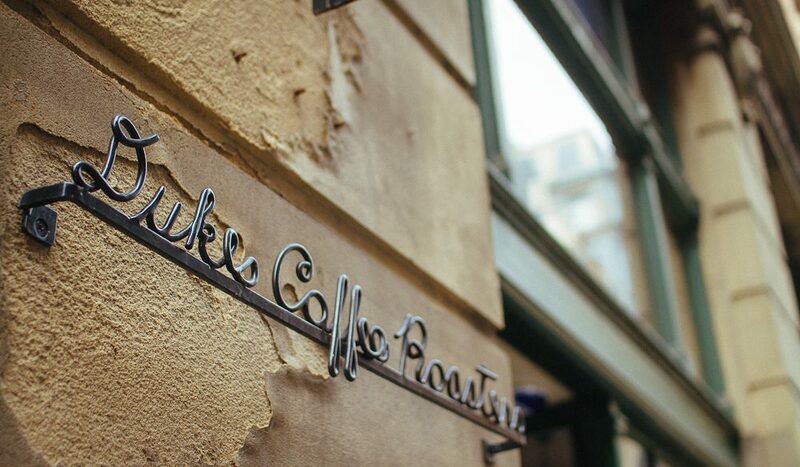 Dukes Roasters embraces Melbourne’s ‘social enterprise’ vibe with a few sips’ worth of every cuppa sold here going to the not-for-profit Ross House Trust, which offers facilities for community organisations. Inside, the subtly crafted décor feels effortless, the fab-patterned floor tiles living comfortably with the ribbed blonde-wood wall panels. 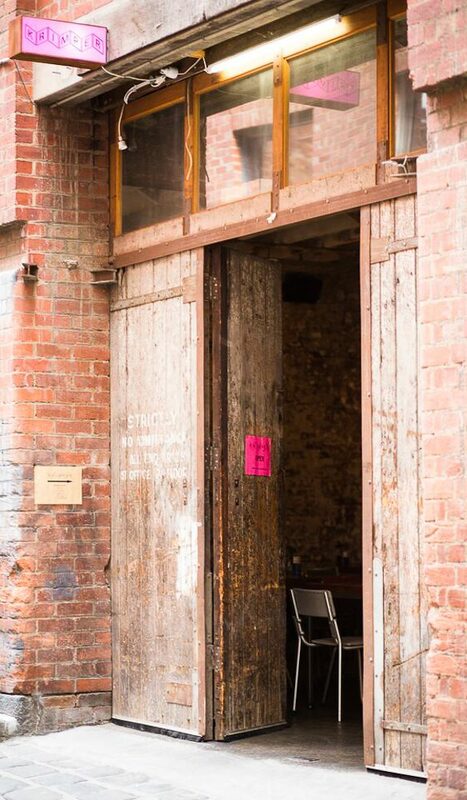 The brew: Coffee by Dukes, Collingwood. Try a simple espresso. Simply stunning: The crockery here feels like it’s straight from classic Italian cinema. 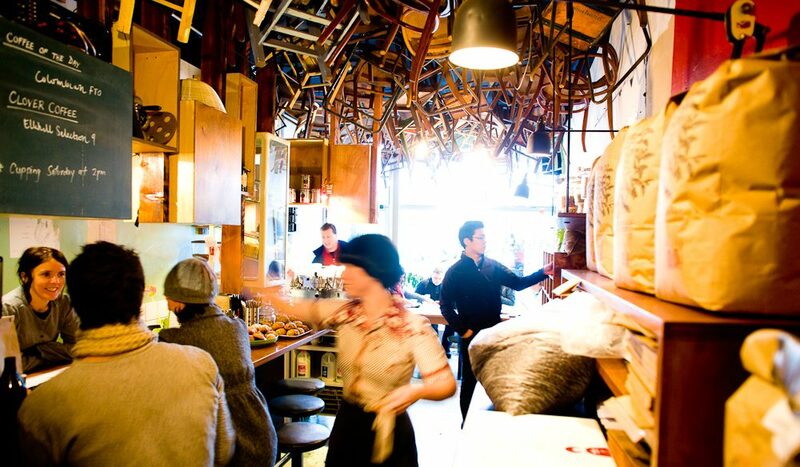 Brother Baba Budan was a vanguard of the CBD’s current artisanal coffee buzz. This perpetually lively hub is funky and cosy (read small) with a dozen useable seats – plus some unuseable ones latched to the ceiling. The takeaway service can be positively humming at peak times, but brave the lines because the super-brisk baristas are adroit at caffeinating the fussy mass. The brew: Coffee by Seven Seeds. Try a soy cap. History lesson: Baba Budan (the man) was said to have smuggled seven coffee beans to India from the Middle East in the Middle Ages, hence introducing coffee to the world. Housed in an old lawyer’s office at the end of town that puts the B in CBD, Patricia offers a varied selection of strong-flavoured but lighter-textured coffee. 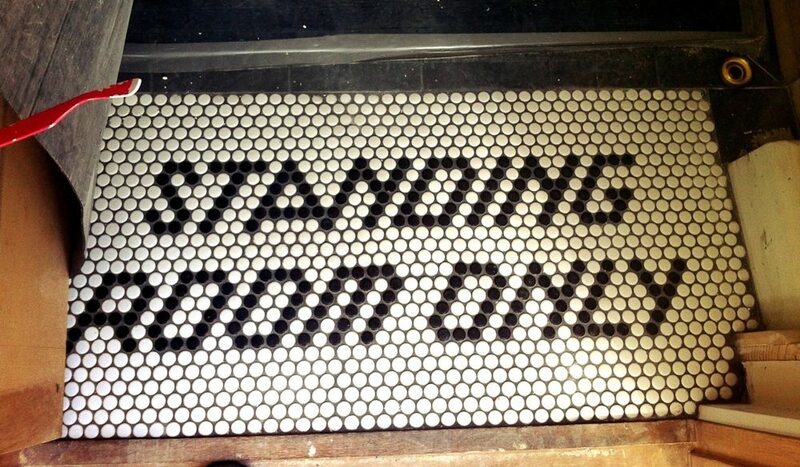 Walk over the tiled ‘Standing Room Only’ sign at the entrance into a charmingly vibrant white-tiled space illuminated by a neon ceiling sign in the shape of the word ‘sunshine’. Why Patricia? It’s named after the owner’s grandma – awww. The brew: Coffee by Market Lane, Proud Mary and Seven Seeds. Try a speciality filtered option. Peckish: Limited selection of pastries. Need a rest: Take a load off on one of the bright orange milk crates outside. Hidden away down a back lane in an old warehouse behind a minimalist façade, Krimper nails Melbourne’s latest coffee chic décor. The reclaimed space, complete with water-blasted exposed brick, maintains an utterly personable vibe despite the potentially cold industrial dimensions. It has more room to move and foodie options than others on the list. The brew: Coffee by Proud Mary. Splash-out on an affogato espresso. Peckish: Duck in Pan or Prawn Pancake. Centrepiece: The 100-year-old steam-powered lift car dining booth. Would love to know if they offered Lactose Free Cappa’s…not Soy, but Lactose Free. The milk is so available, and so many people can’t tolerate Soy nor Lactose. I miss my cappa’s.